SunClock is a novel clock. Rather than displaying the time since midnight, it displays the time since the last sunrise, and optionally time to the next sunset or sunrise. Midnight as the start point for timing a new day is a bit arbitrary and doesn't easily relate to anything you can simply detect in the real world. Notionally 12 hours after the sun reaches its zenith in the sky - you could determine midday using a sextant or similar instrument and start a timer to count 12 hours from then. But midnight itself is not something you can directly observe. Much more natural to use sunrise as the defining point for the start of a new day and then count time from that point. Of course you can define sunrise in different ways, but at least it is something you can directly observe. One consequence of this is that the length of the day varies slightly throughout the year, during spring when the sun rises earlier each day the length of the day will be slightly less than 24 hrs, correspondingly during autumn it will be a few minutes more than 24 hrs. The precise amount will depend on your latitude and the time of year. As well as displaying the time since the last sunrise you can also optionally show the time until sunset, or since the sun set if it has already gone down. You can also display the duration of the sun being up and down and the total length of the day between sunrises. In addition you can display a count of days since the Winter Solstice or from the previous or until the next solstice or equinox. You can also display the calendar dates of the next four equinox & solstice events. All of these options are shown in the example on the right. The simplest use just shows the hours, minutes and seconds since sunrise. You need to set your latitude and longitude in the parameters (simple way to find the lat/long for any location is to drop a marker on Google Maps and copy down the numbers it gives you). You can also set various other options - additional text to be displayed in the module, layout options etc. NB The time is updated by a javascipt window timer. Hence you can only display one instance of the module on a page or the 1 sec timer gets confused and the clocks get updated wrong. Added solstice and equinox dates. Improved timing routines. 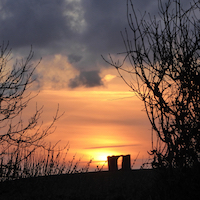 Sunrise and sunset today in North Cornwall.